It was the sounds that drew me. Little did I know that what I was about to witness would hold my interests over the next fifty plus years. In the late 1950s my grandparents moved to a new home in the rural community of Sophia, North Carolina. Spending a weekend there was fun for a curious kid who got to play in the pasture and be around the farm animals. Walking into their house on that fateful Saturday afternoon, I heard noises coming from the den. The television was loud, and Grandpa was louder. The sounds of a crowd included boos, cheers, and assorted yelling. Entering the room I could see on the black and white Zenith two guys fighting in a ring, involved in a spectacle of action and drama. The audience on the show liked one of the men, but not the other. I didn’t know who those guys were, but they and grandpa sure put on a show. It was wrestling. To the best of my memory, it was the first time I ever saw it. At the end of the match, a commercial appeared telling about matches we could attend in person somewhere in the area. I wanted to go there and see it myself. from the Mid-Atlantic Grapplin' Greats site. The next match was somewhat like the first in that it involved another good guy and bad guy against each other, but this time I remembered the name of the young man who won - Angelo Martinelli. 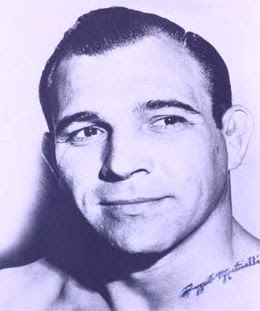 Angelo would appear in many matches as a wrestler and a referee well into the 1970s. Grandma and one of my aunts came in to watch. My aunt told me that she had been to wrestling at a live event, and that she would take me sometime. She never did. The main event was announced as an “Australian tag team match, two out of three falls” that later got the crowd, both in the studio and the room where we sat, under near riot conditions. The heels causing the commotion were Mike and Doc Gallagher. In my child’s mind I decided these guys were truly evil – and smart. They taunted the crowd before and during the match, all the while performing their dastardly deeds that somehow were never seen by the referee. Their signature maneuver was Mike distracting while Doc grabbed his opponent in a headlock and stabbed the guy in the throat with an outstretched thumb. And they got away with it! “Them cheatin’ (expletives deleted)!” Grandpa said as he stomped the floor. What an educational weekend. I received an introduction to professional wrestling, along with new words for my vocabulary. The match was a two straight fall squash against jobbers whose identities escape me. Thankfully, the announcer assures us that justice will prevail next Saturday night in a nearby town when the Gallaghers will have to face the team of George Becker and Billy Two Rivers. “Becker and that Indian will get ‘em.” My aunt assures me. Later that evening grandma watched the Lawrence Welk Show on the same channel. But neither Mr. Welk nor his Champagne Music Makers could equal the spectacle I had experienced earlier that afternoon.